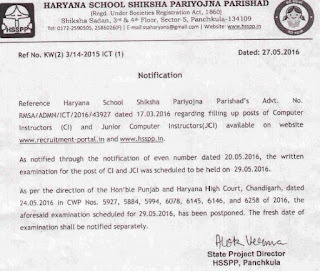 HSSPP Admit card 2016: Recently Haryana Computer Instructor Admit card had been released by HBSE. Haryana School Shiksha Pariyojna Parishad is going to organize written examination for Computer Instructor (CI) / anudeshak. Earlier HSSPP had invited applications for 6672 posts of CI nad JCI. Now the admit cards for the written test are available at bseh.org.in. Eligible candidates who had registered successfully can download HSSPP Exam Admit card from here. Latest News (27.05.2016): HSSPP had postponed the written examination for Computer Instructor posts to be held on 29.05.2016. New fresh dates will be announced shortly. Candidates have to appear for this written examination to be organized from 10:00 am to 12:00 pm and 02:00 pm to 04:00 pm. The selection is based on their performance in written examination. The admit cards for the said examination are available from 23 May 2016 at bseh.org.in. Applicants have to read the instructions given on the hall tickets and follow all the rules. The questions in the written test will be of objective type and it is of 2 hours duration. It is fairly easy to download the admit card of HSSPP Computer Instructor exam. For this, just visit the site given above. It will take you directly to the page at which the details of your registration are to be entered. This way you can download your HSSPP computer operator exam admit card from 23.05.2016.